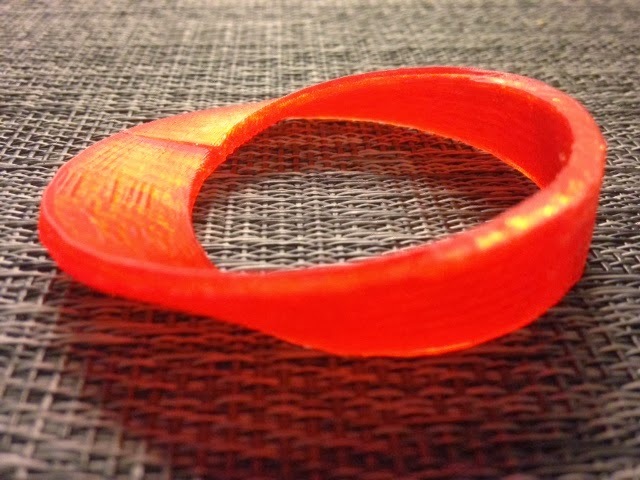 Settings: MakerWare with the custom slicing profile that we use for printing knots (see Day 110), to minimize support. We printed this vertically, standing on the flat side to the right in the picture above. In that orientation the only support that is printed is a small amount at the base and a very thin sheet of support that supports the top of the model through the center. This works beautifully when exported to STL from Mathematica, with one problem: A seam is printed where the parametrization closes up at 2pi. On my printer the model did not split at this seam, but it was visible. Trying to cheat by extending the parametrization to 2pi+.1 just increases the problem with an even more noticeable seam. I had the same seam problem with the rocking knot from Day 110, and didn't resolve it for that model until the OpenSCAD redesign in Day 151. There must be a way to remesh objects like these in MeshLab or some other program, but I don't know it yet. Please let me know if you do!